Actor Suriya isn’t just known for his handsome looks and mind-boggling performance, but is highly looked upon as an inspiration for a stunning physique by many. The actor doesn’t miss to hit the gyms regularly for workout at Hotel Leela Palace and today happened to be a surprising moment. As he made his way into the gym, he saw the master of body building, Arnold Schwarzenegger and was so much astonished to encounter such an incident. Ramesh Babu, co-producer o ‘I’ and brother of producer Aascar Ravichandran introduced Suriya to Arnold Schwarzenegger and they started shooting the breeze together. 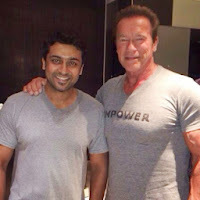 Suriya didn’t miss to show his earnest reverence for Arnold Schwarzenegger and immediately made it possible of picking his Arnold’s book on body building from his residence, which is just few streets away from Leela Palace. In turn, Arnold Schwarzenegger was so much surprised to see Suriya having his book and he autographed his signature on the opening page. Arnold Schwarzenegger reached Chennai airport early morning 3 a.m. and is put up at Hotel Leela Palace to attend the audio launch of ‘I’, directed by Shankar with Chiyaan Vikram and Amy Jackson playing the lead roles and musical score by AR Rahman.